Decontamination is one of the pillars of any Ebola response. A contaminated health centre can contribute to spreading the virus and reduces access to medical care for everyone in the area. 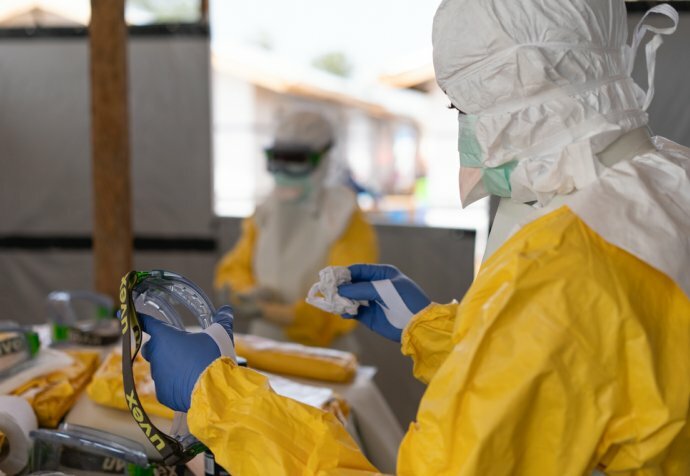 Almost six months after the declaration of the Ebola epidemic in the northeastern Democratic Republic of Congo, response teams on the ground are still struggling to gain control of the outbreak. So far, 619 people have been infected with the virus and 361 have died in what is the second-largest Ebola outbreak ever recorded since the virus was discovered in the country in 1976. Thomas Compigne: What’s important in our job is trying to contain the outbreak when somebody who is confirmed as having Ebola has been to a health centre. Somebody confirmed as having Ebola who visited a health centre might have contaminated the room they’ve been in—the bed, any objects, bedding or the curtains. Our task is to decontaminate these places to ensure the next patient who goes into the same room won’t contract Ebola. Title: Decontamination is one of the pillars of the Ebola response. Thomas Compigne: First we send a health promoter to meet the director of the centre where a case has been confirmed to try and retrace the patient’s movements. We also explain why it’s important to decontaminate the centre as quickly as possible, how we’ll go about it and that we won’t disrupt their work. At the same time, we organise health promotion activities in the area to gain the acceptance of the local community and facilitate the work of the decontamination team. The Health Promoter then contacts my teams who go to the site and start the decontamination of the health centre. They also work with the director to retrace the patient’s movements. Title: A contaminated health centre can contribute to spreading the virus and reduces access to medical care for everyone in the area. Thomas Compigne: Sometimes a patient who goes to a health centre might visit a second and even a third centre, so we can have several centres to decontaminate. In other words, the size of the job can vary a lot and depending on how many centres have been concerned, decontamination can vary from two hours to four and sometimes five. At the end of the decontamination, we have to dispose of and incinerate various kinds of waste—mainly the yellow protective suits, head covers, masks, latex gloves and so on worn by the decontamination team. Sometimes there’s more waste to incinerate. Title: It is absolutely essential to explain to the community the importance of decontaminating. Thomas Compigne: When we arrive to decontaminate a health centre we occasionally encounter some resistance. I myself have seen it happen, but only once, and that was because somebody died while we were decontaminating. Infection Control and Prevention usually requires the health promoter stepping in prior to decontamination, which is carried out in places where MSF is providing assistance. This means that the community is already aware of MSF’s role in decontamination and there’s a good level of acceptance of what we are doing in the health centres. Title: In northeast DRC MSF runs two Ebola treatment centres and two transit centres.